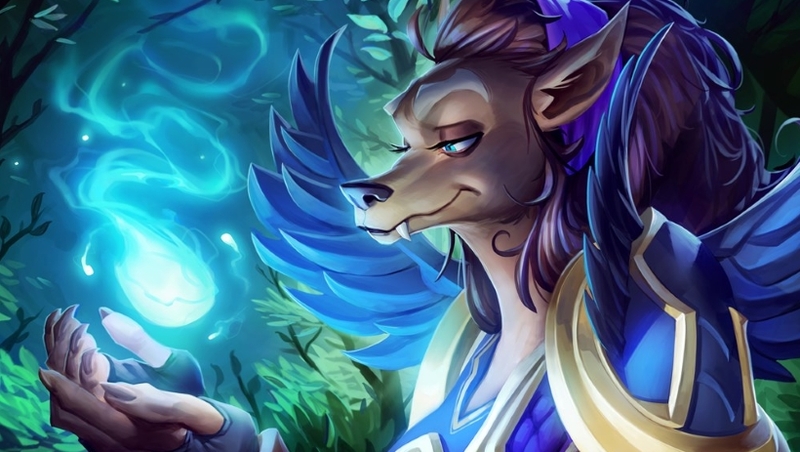 Our Token Druid deck list guide features the best Rise of Shadows deck list for Season 61 of Hearthstone (April 2019). Our Token Druid guide also contains Mulligan advice, card combos and strategy tips. Token Druid is a Hearthstone deck that has been around in many forms of the years, with its heyday taking place in 2018 thanks to some incredibly powerful cards in The Witchwood and Boomday expansion sets. After the class saw a number of nerfs around Rastakhan’s Rumble, however, the deck fell out of the top tier. With Rise of Shadows, though, there’s a chance that Token Druid could be returning to its former glory thanks to a handful of new spells and minions that encourage a heavy aggro approach. It’s been finding a lot of success on the ranked ladder already, and some players are considering it to be a bit of a sleeper hit in the early days of the new expansion. Not wanting you to miss out on this chance to soar up the ranking while the getting’s good, we’ve fully updated our Token Druid guide with the latest deck list that’s crushing many opponents in Hearthstone. Further down, you can also read our basic strategy advice on how to play the deck as well as our breakdown of many key combos found in it to get the best results. This version of Token Druid comes courtesy of Dog and is considered to be the strongest iteration of the deck right now. As we’re in the early days of Rise of Shadows, though, we’ll be sure to update this list if there are any drastic changes. Token Druid is a very fast aggro deck that aims to flood the board with extremely cheap minions and then make them progressively stronger by applying a number of group buffs. Each turn your plan is very straightforward: empty as much of your hand onto the board as possible and then buff those creatures. Play aggressively, only take trades when necessary and push for face damage at all opportunities. What makes Token Druid thrive in the current environment, though, is its ability to very rapidly re-establish a board presence turn after turn. Many decks – even the most extreme control ones – simply don’t have enough area of effect removal in order to stop the onslaught and so your opponent is left completely helpless. The Forest’s Aid, the new Rise of Shadows spell, plays a big role in the deck’s success. Early game: Flood the board with all your early drops and slowly start chipping away at your opponent’s life total. You may lose a creature or two to removal effects, or be forced to make a trade in some situations, but that’s not too much of a problem as you always have more cheap minions ready to go. Look to find ways to trade up or eke out more damage with the likes of Dire Wolf Alpha or your buffs cards such as Power of the Wild and Blessing of the Ancients. With the latter two, you’re aiming to hit a board of at least 3 minions to get good value from either spell. Mid game: Keep making your board as wide and as overwhelming as possible. You’ll want to be moving into a position where you can end the game in the next few turns to ensure slower decks can’t stabilise. A well-timed Savage Roar on an especially wide board is a devastating finisher – even this early! You’re entering dangerous board clear territory too, so look to buff your minions out of damage range, or give yourself some insurance if they are killed with Soul of the Forest. Late game: If the game isn’t won yet, your opponent is, hopefully, on their last legs so you can finish them off very soon. If they’ve managed to wipe out all of your previous boards, you can immediately give them a wall of problems to deal with once again using The Forest’s Aid. As it’s a Twinspell, a copy will sit in your hand ready to be used again in the future. Meaning, if they somehow find more board clears, you’re prepared to establish another on the next turn once again. Not a lot of decks can weather all that constant pressure! 1. There is no overt board control in this deck so look for some trades against aggro in order to prevent them from steaming ahead. 2. Aggro decks often lack strong board clears, so once you start generating and buffing token creatures you can make more efficient trades and take control of the game. 3. If you absolutely must, you can use Savage Roar to give you some extra attack power to kill off your foe’s creatures, although you'd prefer to save it for the kill. 4. The extra Shaman spells you generate from Witch’s Cauldron can be a huge help in finding extra removal or burst damage against aggro. 1. This deck is already very aggressive, but you’ll want to play even more quickly against control to defeat them as soon as possible. 2. You’ll want to play as much as you can on the board each turn but do be cautious of committing all your resources to a single play if you think a board clear could be coming next turn. 3. That said, Soul of the Forest and The Forest’s Aid are both excellent counters to board clears as your opponent will have to find a way to deal with a whole new board immediately. 4. The best way to win against control is to surprise them with lethal damage. Save cards such as Savage Roar to achieve this. 5. With no hard removal, your best way to deal with big threats is to generate a large enough board to push through them, or aim to defeat your opponent before they can get them down on the battlefield. While we’re in the early days of Rise of Shadows we’re holding off on giving too specific Mulligan advice until the meta settles. For now, though, you’ll want a good balance of your cheap minions and maybe a single buff spell in your opening hand. You’ll also be very happy if you have a couple of one-drops and a two-drop to get you started quickly. - Once you’ve got a healthy board established in the early turns, look to get those creatures buffed as soon as possible using Power of the Wild and Blessing of the Ancients. - Try to ensure you place Dire Wolf Alpha between two minions so they both receive the extra Attack buff. It’s great to help your minions trade up or sneak in a couple of extra points of damage. - All the buff cards in the deck mean you should have multiple ways to activate Scarab Egg and hatch more tokens onto the board. - All friendly characters - including your hero - gain two points of Attack when Savage Roar is cast. This is your core finishing move. - Soul of the Forest gives all of your minions a Deathrattle effect that summons a 2 / 2 Treant in their place when they die. These can sometimes be stronger than the cards you had in the first place and can leave you with wide boards after your opponent has used an area of effect spell. - Witch’s Cauldron is perfect for this deck as all the small token creatures they can die quite easily and grant you lots of bonus spells. Acornbearer: Fairly unassuming one-drop but comes with the bonus of granting you extra token creatures on death, which you can use to flood the board immediately. Saronite Taskmaster: The downside isn’t too much of a concern considering the massive stat boost this minion gains for a one-drop! Power of the Wild: A powerful card that can buff your entire board by +1/+1. You shouldn’t be using it to summon a minion. Dire Wolf Alpha: All the tiny token creatures in the deck have rather piddly Attack power and this cards helps them do extra damage to your opponent or trade up against their creatures. Blessing of the Ancients: Similar to Power of the Wild but there’s the chance to get even more value out of it thanks to the Twinspell keyword, which will give you another copy of the card after it’s been cast. Savage Roar: Perfect for finishing off your opponent with some surprise burst damage if you’re well entrenched on the board. Soul of the Forest: An insurance policy against your opponent’s board clears that ensures something will remain even if they wipe out your creatures. Witch’s Cauldron: Perhaps not a vital card, but its hand refill potential is huge in a deck which usually has lots of small creatures on the board. Tending Tauren: Useful mid-game card as it can be used to further buff your board if you’re in a dominating position, or help you re-establish one if you’ve fallen behind. The Forest’s Aid: A huge part of the deck’s success. Many aggro decks will have run out of steam by turn eight, but this spell ensures you have a way to build a wide board fast again on two subsequent turns. @guitardude No version of Token / Treant Druid is part of the competitive meta at the moment but this is the version seeing most play. Consider this a warm-up for a better version of the archetype to come next week. I've mentioned this in the update at the top of the article. Token Druid is top of the list for a Rise of Shadows update and there'll be a proper overhaul of the guide then. Is this a joke article? This list is horrible, it runs Tortollan Forager for no reason, a bunch of bad treant cards that support other bad treant cards and just doesn't run the actual good Druid cards. Spreading Plague, UI, Branching Paths, Oaken Summons, ways to actually stay alive. It runs no card draw or armor in the class with the most available card draw and armor. If you don't curve out you will instantly lose board, and when you do curve out your cards are weak so you'll lose board anyway. It also talks about Violet Teacher and Malfurion but they're not in the deck, and it says Whispering Woods "is based on the cards in your hand so is more effective earlier on in a game" which is literally the opposite of when it's good. Just play the Witchwood version from a year earlier + Zilliax, it's way better than whatever this is. It's a great treant deck but an awful token deck. Your new lineup for this deck adds up to 31 cards. Could I add one or two copies of Evolving Spores to this deck? Half for fun, but half because SOME of the adaptions are great (+3 attack, windfury etc.) for Token Druid, and I think it would be a very good experimental mechanic. Should I add some copies; if yes, should I add one or two, and what card(s) should I remove? Hi folks, apologies for the delay in getting an update for Token Druid up on the site. I've been on holiday for the last week, but have now slotted in what seems to be the most popular new version of the archetype. I've also tweaked the rest of the guide to reflect those changes. I'll take another look at the deck when the November season starts. PS: in the 'card choice and substitutions' Oaken Summons and Violet teacher are still mentioned --> remnants from an earlier version of this deck. @StevenWard94 Let me know if you figure something out! @Kurthnaga I have precisely the same question. GI is (pretty much) as good as dusted now that it's a 7 drop but I've been struggling to find a comparable replacement in a number of my decks. I guess this is sort of a lost cause as Blizzard probably wouldn't have nerfed GI like that if there were a bunch of other equivalent minions in the mix but I'm still not sure of the "best" way to substitute for the utility that Giggling Inventor provided. Should Giggling Inventor be switched out for something else now that it costs 7 mana to summon? Hey what would be a good replacement for Flobbidinous Floop? @PhoenyxSam Whoops! Thanks for this and the nice feedback on the guide. Token Druid is on the update list for today so I'll get that tweaked for you. Appreciate the heads-up. @Bedders Thank you for this awesome guide. I just started playing Token Druid and made my first two wins with it. I found this guide very useful. Just a little note regarding it. "- All friendly characters - including your hero - gain three points of Attack when Savage Roar is cast." Savage Roar gives +2 Attack instead of +3. Thank you again. @Nerrkanta Hi Nerrkanta. As I say in the update section the rest of the guide will be converted once things settle down a bit - otherwise we're just re-writing the same thing over and over again! I just wanted to get a fresh deck list in front of people first and foremost, so everyone's got a new version to get stuck into. There are dozens and dozens of articles to update fully in launch week but we'll get there eventually! @Bedders Now that you're at it - should also change the Mulligan part ("Next up is Oaken Summons, which not only provides you with some handy Armour, but will also drag Ironwood Golem into play."). @AlferdPacker Hey sorry I'm an idiot and missed both your comment and the mistake! Thanks for letting me know about this. I've revised that section in the latest version of the guide which I've updated this morning. - Oaken Summons always brings Ironwood Golem into play, as its the only qualifying minion. Obviously you need a copy of that creature in your deck for the effect to go off! This isn't true, as it can also summon either of the Violet Teachers you have in the deck. Is there any good replacement for finja? Or should I just wait for the dust to craft it? @BetaMomb Noted and fixed, thank you! Nothing too important, but Finja is labeled as a Druid card. @buffguy404 Yeah it's a lot of fun, I keep going back to it! I find this deck incredible and also very cheap! Its a great deck to play if you are a veteran (such as myself) and it is also a great cheap deck for new players! Overall i really suggest this deck to new and old players as it is incredibly fun to play . do you think you can add video guides on the play style and how to use these decks properly? @Twisted-Code I don't agree that Yogg is useless and - outside of tournament play - I'm far from alone in that opinion right now. I may yet be proved wrong, along with far better players. What can i replace bloodmage thalnos with ? @Bedders LOL. Any other replacement that you can recommend for Cenarius? In the mean time i am using Wisps. @Ironsam Hello, sorry about that. I always do a quick count to double-check before posting but my mental arithmetic has let me down here. Have fixed now and thanks for letting me know! Theres only 29 cards on this decklist? Tried Chakki's version? I need to try out the Finley Mrggl rather than a second Leper! Can I repleace raptor with shade of naxx?And is it good? I've had terrible mulligans with this :\ But every game with this deck was a good fun game where I had a shot.